Dreamy Mount Pajamaja is the Dream World's version of Mount Pajamaja and location in Mario & Luigi: Dream Team. It is the fifth location visited in the Dream World. Mario comes here to escape the Dreambeats. He eventually comes upon the Mount Pajamaja boss and irritates it by repeatedly whacking its nose. The angry mountain does battle with Giant Luigi after a short cutscene, and is eventually defeated. Mario and co. return to the real world and discuss their next plan of action. This is also the location where the Bros. learn the Luiginary Hammer. The main Luiginary Work of this area is the Luiginary Ice that changes to a hot sun when a button is pressed in the real world. When the Luiginary Ice is cold, everything in the Dream World is frozen, making the platforms icy and slippery and causing water to be frozen pillars. Everything is melted when the sun turns hot. The water pillars raise and lower at regular intervals, though they will remain at the lowest point when Mario stands on them. 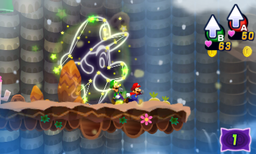 The concept of freezing and warming the area up is similar to the Airway area from Mario & Luigi: Bowser's Inside Story. This page was last edited on November 20, 2017, at 19:32.